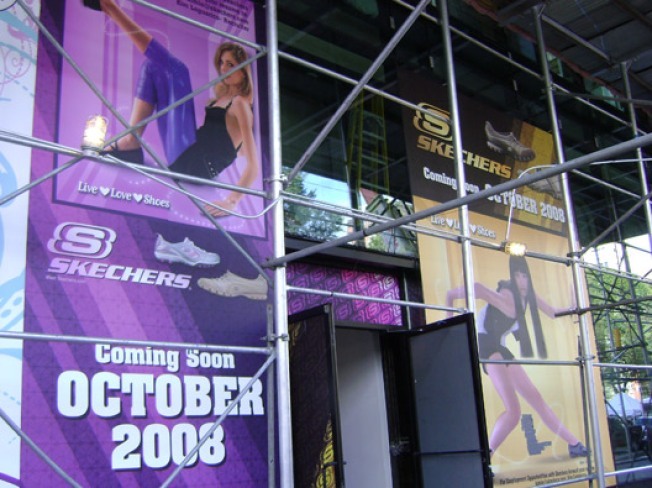 Sidling up next to the new Lululemon Atheletica at 15 Union Square West will be the city's third Skechers shoe store. Our peek inside revealed that it is far from a flagship, baring more of a resemblance to the company's numerous mall locations. Due to open yet this month, Skechers will join what is already a glut of shoe stores in Union Square; neighborly competition from DSW, Puma, Diesel, Geox, Paragon Sports and Shoe Mania should keep Skechers on their toes. Since Lululemon and Skechers have claimed two of the three retail spaces on the ground floor at 15 Union Square West, who has nabbed the choice corner? Sorry to say it, but the obvious answer is the right one: another bank (an HSBC) will open this branch before November.